If you write, and especially if you are a new writer, correct grammar and punctuation are vital for you. Using a free grammar checker and online punctuation checker tools is the first step in preparing a text to make sure it is as error-free as possible. Every writer knows that there is no replacement for meticulous proofreading, but that is the last stage in the writing process. The role of an online grammar checker, punctuation checks and a spell checking tool are to find suggested corrections. When an automated tool checks your text, it is up to you to make decisions about each corrected word or highlighted sentence structures. English grammar is open to interpretation. Its application can vary between different forms of the English language such as US, UK, Australian, Canadian or Indian English. As a writer, no tool can replace your judgement and your knowledge. However, you can save a lot of time by putting your text through a free spelling and grammar check to quickly find grammar mistakes, spelling errors and misused words. But punctuation issues are not always recognised very well by some free and online checkers. A very good checker will help you find possible punctuation errors, which are often difficult to notice. Is a comma necessary, or should you omit it? A good comma checker can help you decide. When you run a free check, it should quickly help you find comma errors, missing question marks, colon errors and mismatched quotation marks. These types of punctuation corrections are much easier to make if you can rely on your grammar checking software to find them for you. But it is not always the case. So I use two, to be sure. 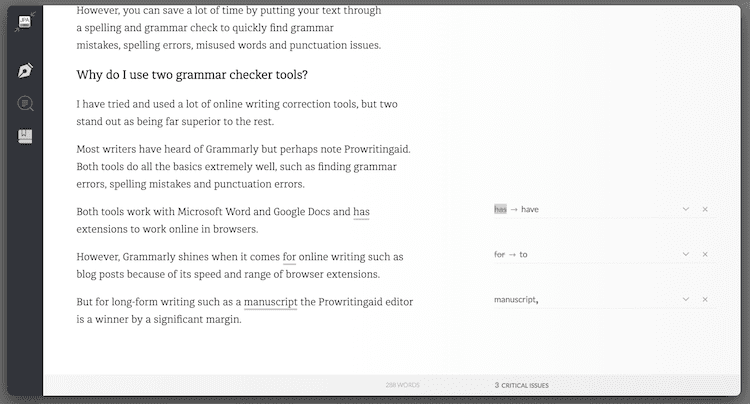 Why do I use two grammar checker tools? I have tried and used a lot of online writing correction tools, but two stand out as being far superior to the rest. Most writers have heard of Grammarly but perhaps not of Prowritingaid. Both tools do all the basic checks extremely well, such as finding grammar errors, spelling mistakes and punctuation errors. Both tools work with Microsoft Word and Google Docs and have extensions to work online in browsers. However, Grammarly shines when it comes to the online writing of articles or blog posts because of its speed and range of browser extensions. The red underlined spelling error tool alone is worth its weight in gold. But for long-form writing, and in particular, a manuscript, the Prowritingaid editor is by far the best option available. If you only want the basics, such as a free punctuation checker, a spell checker and a grammar check tool, the free versions of Grammarly and Prowritingaid will do the job for you. But of course, both offer premium versions. These provide a lot more tools including a plagiarism checker and have no restrictions. These and are the versions I use. Here is a quick look at both tools in action for grammar, spelling and punctuation. When I have a long text to check, I open the Prowritingaid online tool and get to work. But if you think it is only for checking grammar, you will be in for a few surprises. A quick look at the menu tells you how many tools are available to analyse a text in depth. Once you complete the initial checks, you can dig much further into your writing and look for ways to improve it. Each menu button opens a new report and gives you a list of suggestions you can decide to act on if you think it will help your text. It is the little things that count when it comes to looking for ways to improve your writing. One small style suggestion can make all the difference. 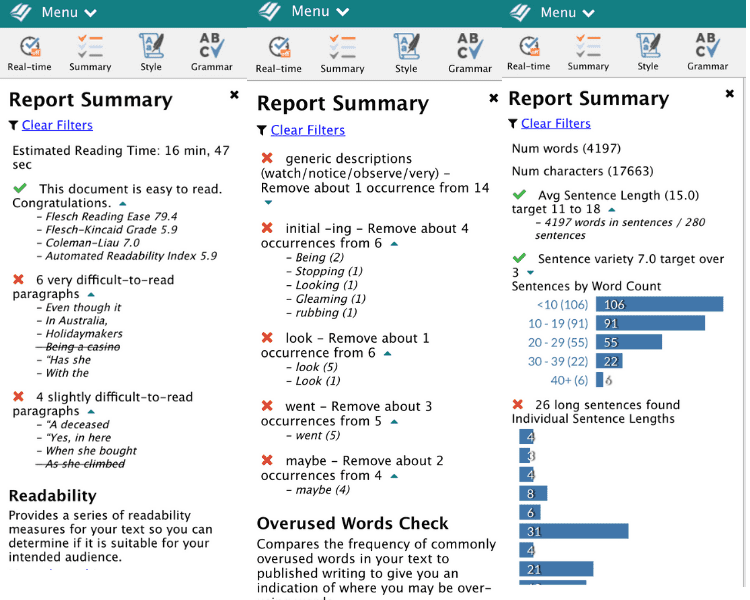 In the three example reports below, you can see how much detail there is to work on when you analyse a text. The reading ease summary is a huge help and getting advice on repetition and overuse of words is invaluable. Isolating long sentences, and possibly run on sentences is so much easier when you have a clickable list of potential problems. If you are an author or writer of short stories or even long-form articles, the editor in Prowritingaid is an extremely powerful tool that you will find indispensable. It takes online writing analysis to an entirely new level. Yes, it will find your grammar, spelling and punctuation mistakes. But more importantly, it will help you analyse your writing and guide you towards making many more improvements. Whenever I write online, I have Grammarly turned on. It is a bit like my writing insurance policy. There are Grammarly extensions for Chrome, Safari and Firefox, which are the browsers I use all day long. So if I am writing a quick post on Facebook or Twitter, replying to comments on my blog or writing a new blog post, Grammarly is helping me with my writing accuracy. There are a lot of free online checkers, but very few are as fast and as accurate. There is no lag time with Grammarly, so any error is quick and easy to correct with one click. If I make an error or a typo, a red line pops up immediately to warn me. To make a correction, all I need to do is hover over the red line for a popup to give me a one-click correction. In the image below, I can instantly correct the wrong verb and missing comma. Then I can carry on writing without leaving my blog editor. However, if I want to dig deeper into my text for a more complex grammar and punctuation check, all I have to do is click the check on the red circle, and the online editor opens in a new popup window. In the editor, I can accept corrections with one click, or make edits to the text. All without leaving my browser page, or my WordPress editor. If your job is writing, all day long, nothing beats the speed and efficiency of Grammarly. If you are relatively new to writing, either as an author or a content writer, these two free grammar, spelling and punctuation checking online tools will become indispensable for you. Try them both, and I am sure you will see why they can help you quickly improve your writing skills. Even if a free grammar check finds just one error, it is worth it. You should certainly try using the free version of both tools. But after a while, you might decide that one is better suited to your writing needs, and you would like to upgrade to the premium version. While I use both because I write both long and short form, the decision about which one you should choose will depend on your needs. For an author, I would always suggest Prowritingaid as the best premium option because it offers a much deeper analysis of long texts such as a manuscript. Another big plus for Prowritingaid is the price. It is very affordable. If you are a blogger, article or content writer, Grammarly is the most logical option because it works with you on any platform or browser. We live in a fast-paced world and writing quickly yet accurately is becoming standard practice. But we all know that is not an easy task. However, with a little help, it is possible to produce relatively clean texts in a short period of time, before getting down to the meticulous proofreading stage. I have Prowritingaid and Grammarly. As you recommended, I use Prowritingaid for my manuscript writing and Grammarly for online writing. I recently upgraded to Grammarly Premium. I didn’t realize what additional editing it offers. I’m glad I made the investment. Thanks for your advice. Glad to hear, Chuck. I use both every single day. They are writing and online lifesavers.